Since none of you have told me you hate it, I'm going to keep on keeping on with this here new feature. I hope you'll continue to indulge me. Today's subject matter is a steamy summer night from a few weeks back, taken on S Street on the way back to my car after another enjoyable night out. Being in the deepest depths of summer, it was a hot night. The air was so steamy, so humid, and there was something a little mystical about the whole evening that I had to stop and take a couple photos. 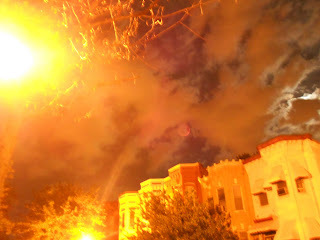 The way the moon lit the clouds was breathtaking. It's the kind of night that this haunting little Black Mountain song was made for.